The Hill House in Helensburgh is considered to be Charles Rennie Mackintosh's domestic masterpiece. While Mackintosh was a revolutionary designer, cutting-edge materials and building techniques of 1902 have not withstood the Scottish weather. The National Trust for Scotland is now undertaking an extraordinary conservation project by placing a mesh ‘box’ over and around the building to allow it to dry out. As the insides of the house are moved out and the outside of the house is boxed in, the National Trust for Scotland and the Lighthouse welcome you to explore the unique collection away from The Hill House for the first time. 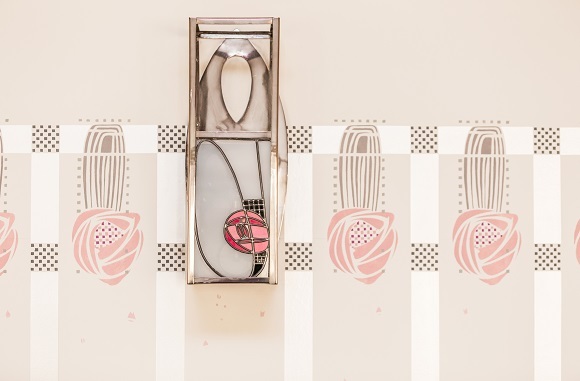 Working with his wife, Margaret Macdonald, Mackintosh designed the rooms and interior features of the house including those most well-known: the entrance hall, drawing room and main bedroom. Items from all these spaces are represented in this exhibition including chairs, light fittings, beds, mirrors and tables. Part of the Mackintosh 150 programme.